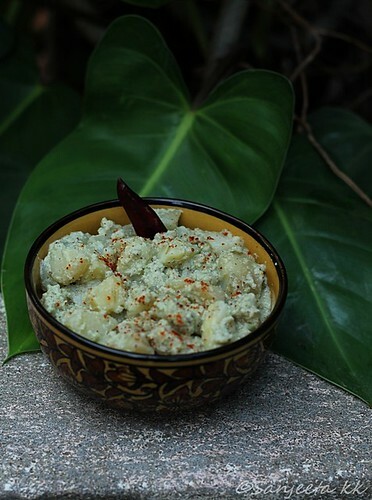 A SARASWAT recipe, Saasam, meaning mustard seeds in konkani, is a side-dish with many variations prepared by tossing vegetables, and also fruits, in a coconut-mustard dressing. This is a popular dish of the Saraswat cuisine. 1. Boil the potatoes, peel and chop into small bits. 3. Toss the potatoes into the coconut dressing. Add more salt if required. Serve as a side-dish in a meal. To tweak this into a Jain recipe, substitute the potatoes with raw plantains as a typical Jain recipe does not include any root vegetable. For more Jain recipes, enjoy the variations mentioned here. Replace the potatoes with okra. Chop ¼ kg ladies finger (okra) and roast in 1 tbsp oil until done. Mix with the saasam paste. Replace the potatoes with ripe mangoes. Peel and chop 2 ripe mangoes into small bits. Add 1-2 tsps of jaggery while grinding the paste. Toss the chopped ripe mangoes into the paste. Add chopped pineapples along with mangoes in the above recipe. This is considered as the fruit salad among Konkanis. Some people enjoy adding grapes and tomatoes as well. This recipe was first published in The Great Granny Diaries – a column in Harmony Magazine. Part-1 of this post is the interview with Meera Savoor, a Saraswat grandmother from Chennai.